We are quickly approaching the ten year mark since the housing downturn. 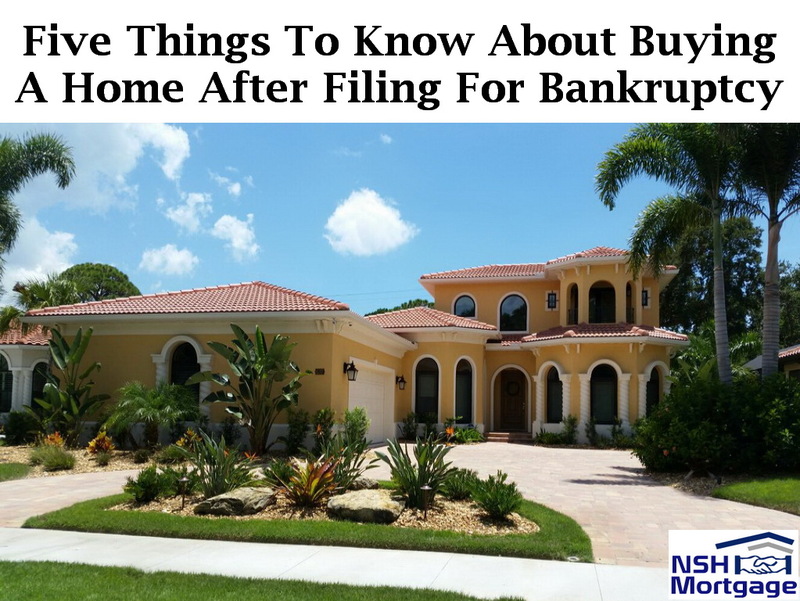 Five things to know about buying a home after filing for bankruptcy. NSH Mortgage has the wisdom and tools to help you with buying a home after bankruptcy. Things look much different across the housing landscape than they did at the height of the recession. Employment is stable and homeownership is once again pursued. As time proceeds, many homeowners are getting back on track after a foreclosure or bankruptcy. They are meeting required mortgage approval waiting periods as financial events get further behind them. A bankruptcy is not the end of their home-ownership journey. In fact, it is very realistic that they can buy again after bankruptcy. All major mortgage programs available today like: Conventional 97 loans, USDA loans, VA loans, and FHA home loans, have built in guidelines that allow post bankruptcy buyers to qualify for a mortgage. Following a few best practices, families are able to get back into a home they love. For many, a job loss led to a foreclosure, which in turn led to a bankruptcy. This is due to a common outcome of a foreclosure, a deficiency. A deficiency is a expense from the previous lender for the total amount they lost in the foreclosure. For example, a homeowner owed $150,000 on their home. It sold in foreclosure, also known as a sheriff sale, for $50,000. That means they still owe $100,000, which becomes the deficiency on the loan. The lender has the option to seek a judgment for the deficiency. Each state has different laws regarding this matter, however. In some areas the former owner only receives a 1099 and the deficiency is viewed as income for tax purposes. Paying off this deficiency can be unrealistic for many individuals and families. Especially, when they no longer own the home, and the foreclosure was caused by circumstances outside their control. The course of action that many people take is to file bankruptcy to clear their name from the deficiency. If this sounds like your situation, you probably filed a chapter seven bankruptcy and included your home and mortgage. You did what you had to do to get a fresh start. Fortunately, this action does not disqualify you from ever getting a mortgage again. You got back on your feet, re-established your credit, and you feel like you do not need to be renting anymore. Now you just have to make sure enough time has passed. Each loan type has its own waiting period guideline after a bankruptcy. Waiting periods for the four major types of loans are as follow. While these are the regular guidelines, you may qualify for a conventional or FHA loan even sooner. Both loan types have exceptions for extenuating circumstances or one time events that caused income loss and that were outside the homeowner’s control. Specifically, here an applicant can be authorized for a conventional loan just two years after bankruptcy, and a FHA applicant can receive approval after just one year through the Back to Work program. The foreclosure waiting period for a conventional loan is typically seven years. Furthermore, you may qualify for a substantial reduction if the foreclosure was tied into the bankruptcy. The key here is to understand when the foreclosure was recorded compared to your bankruptcy discharge date. Different rules apply if the foreclosure happened before or after your bankruptcy. You can find the foreclosure completed date on your county’s website, which records all property sales, foreclosure or otherwise. Things are simple when the foreclosure happens before the bankruptcy. The waiting period starts at the bankruptcy discharge date. For instance, your home was foreclosed in June 2011. Then, you filed for bankruptcy in November, and the bankruptcy was discharged in December. The waiting period begins in December 2011. If you wanted a conventional loan, for instance, you would be eligible in December 2015. This assumes the bankruptcy was not caused by an extenuating circumstance, in which case the waiting period would be up in December 2013. But what happens if the sequence is reversed? That is, the foreclosure occurred following the bankruptcy was discharged, not before. Sometimes, homeowners believe their foreclosure is complete and include their house in the bankruptcy. But the foreclosure or sheriff’s sale did not take place until later. This is an important point because different loan types view this scenario differently. With FHA, the average foreclosure seasoning applies, which is three years. However, conventional loans are actually more lenient than FHA here. With conventional, you can still go by the bankruptcy discharge date. It does not matter when the foreclosure is complete since the mortgage was also included in the bankruptcy. This waiting period of four years applies to the bankruptcy. FHA homeowners could run into an increased amount of issues. But sometimes it is not, even years later, and your new lender encounters a problem when you apply for a new loan. The lender will request a debt and default check from a system called CAIVRS, a federal government database that records the status of federal debts like FHA loans. More importantly, you can appeal the current standings of the status in your CAIVRS findings. Housing and Urban Development, FHA’s oversight body, maintains an email address to which you can send pertinent documents and information. In an email, provide the closing statement or proof of when the home was sold on sheriff sale. You can usually find that on the county website where the home is located. HUD will actually answer within a couple weeks sometimes. This is huge because most people think that if they have a CAIVRS issue, there is no hope of getting it fixed. Although, this support mechanism is in position to clear up issues that have fallen through the cracks many years ago. Re-establishing your credit involves opening credit accounts and paying them on time for at least 12 months. Keep the accounts open and active. Start with a credit card. Use it for gas, and pay it down every month. Keep a small balance on it so the credit bureaus can see that it is active, but try to keep it below 30% of your available balance. Owing much less than your available balance boosts your credit score. The credit bureaus love to see a diverse credit profile, and will reward you with better scores if you have more than just credit card accounts. Examples of other types of credit you should open are personal loans, student loans, and car loans. The credit bureaus and lenders want to see that you can responsibly utilize credit. Limited re-established credit was present, then the lender may look for non-traditional credit like 12 months of cell phone bill, gym membership, car insurance, or cable bill. With some planning, you can build your credit score back to the level at which you can qualify for a home purchase.